A steam locomotive could not operate without its tender. In recent posts I have written about how the locomotive works, but the engine must have fuel and water to produce the steam. The tender is the car that is hooked immediately behind the locomotive and ahead of any freight or passenger cars. The engineer operates the controls that drives the locomotive that pulls the train. 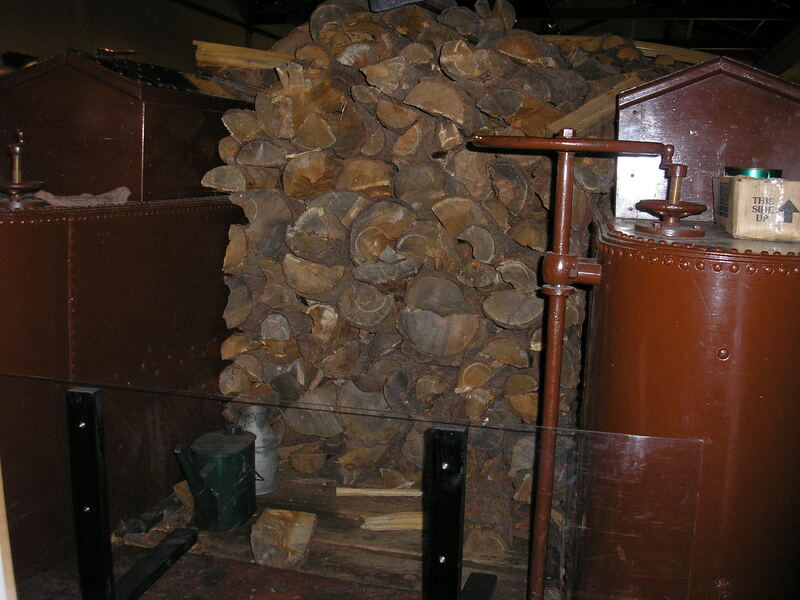 He is assisted by the fireman who feeds fuel from the tender into the firebox of the engine, which he does by hand in the case of wood and by shovel in the case of coal. The water is transferred from the tender via a hose and valve system. The supplying of water to the engine’s boiler is typically performed by the fireman. The above photo of the Central Pacific’s Jupiter, the original of which appeared at Promontory Summit, Utah, during the driving of the golden spike on May 10, 1869, reveals the hose that transfers water from the tender. It is visible just above the left wooden barrel in the center of the picture. The following diagram provides a clearer view of that hose. Will Braddock, in The Iron Horse Chronicles, becomes quite familiar with the trains of the mid-nineteenth century. The locomotives that he encounters in his travels along the route of the first transcontinental railroad are 4-4-0 engines and their associated tenders. In Eagle Talons, Will is amazed on his first train ride when he experiences the thrill of moving at forty miles per hour. A horse can run that fast at a gallop for a mile or two; but a locomotive in the late 1860s could maintain that “blistering” pace for ten or twelve miles, once it got up to speed. The reasons the locomotive of that day could not do it longer was because of the limiting factors of water, fuel, and track conditions. The Union Pacific and the Central Pacific built stations along their lines about every twelve miles, where they positioned a water tank so the tender’s tanks could be replenished. The tender only held enough water to permit the train to travel ten to twelve miles. Trains were much faster than riding horseback or traveling in a wagon or stagecoach, but the journey was regularly interrupted because of the frequent stops needed to add water and fuel. The tender consists of a water tank system that occupies the rear and the two sides of the car. The hollow center section of the tender, between the side tanks, is where fuel is carried. 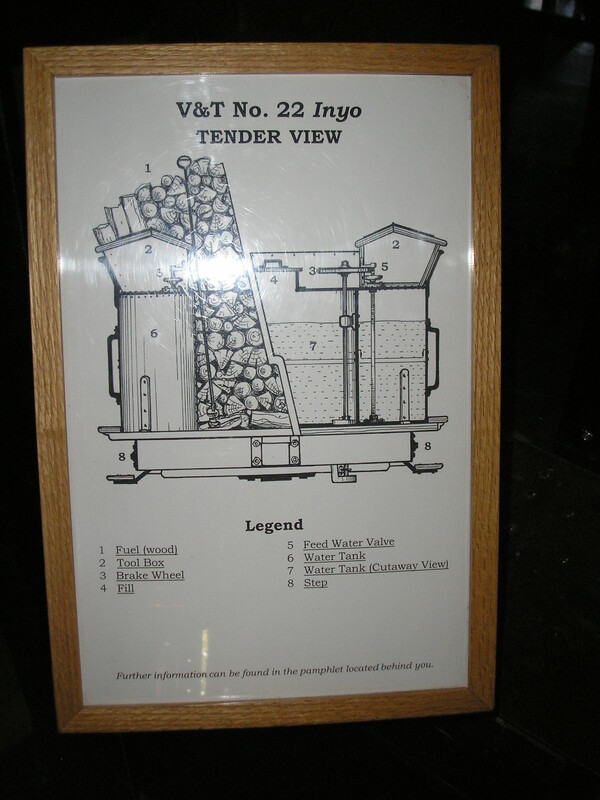 This photo and cut-away diagram, from the Nevada State Railroad Museum, shows how the tender for the Virginia & Truckee No. 22 Inyo is constructed. The third limiting factor was the condition of the tracks. The rails used for the first transcontinental railroad where iron, not steel. These lightweight rails were hurriedly laid because the UP and the CP were in a race to cover the most miles possible in order to earn the government-sponsored bonds that funded the construction. When the rails were not put down on solid footings of good quality timber ties and not carefully aligned, the resulting surface was uneven. The engineer had to use caution to keep his locomotive and train from jumping off the tracks; therefore, maximum speed was seldom achieved. This entry was posted in Central Pacific, Eagle Talons - Book One, Iron Horse Chronicles' Characters, The Iron Horse Chronicles, Transcontinental Railroad, Union Pacific and tagged Adventure Fiction, Eagle Talons, Fictional Character, First Transcontinental Railroad, Frontier Fiction, Historical Fiction, Locomotives, Middle Grade Fiction, Museums, Teen Fiction, The Iron Horse Chronicles, Trains, Transcontinental Railroad Locomotives, Western Fiction, Will Braddock, Young Readers. Bookmark the permalink. We just read an article which stated that on a “hard run” a fireman might shovel 2 tons of coal per hour. How did the coal get to the fireman to shovel that amount in that short of a time frame? Before the 1920s, the fireman had to reach into the tender behind the locomotive with his “scoop” (shovel) and manhandle the coal forward into the firebox of the locomotive. Later, the railroads introduced a conveyor system using a screw device to pull the coal out of pile in the tender and move it forward into the locomotive’s cab. When I was a little girl around 1948, my family was calling me the tender, because I was drinking water all the time. My father was working for the Canadian Pacific Railway, my uncle was the Yard Master, and my mother’s brother was the Station Master in Trois-Rivières, Quebec, and my oldest brother became a real fan of steam trains. His collection of steam trains is at the Museum of Steam Trains in St-Constant. His name was Roger Boisvert, he often made me listen to discs with the sounds of trains, and I always listened to it with great pleasure, and I miss them. It was great to be near one when I was a little girl, went on vacation one day just to make a trip in one of then in Steamship Town in USA, just to get that nice feeling again. Thank you, Madeleine, for sharing that fascinating family experience.